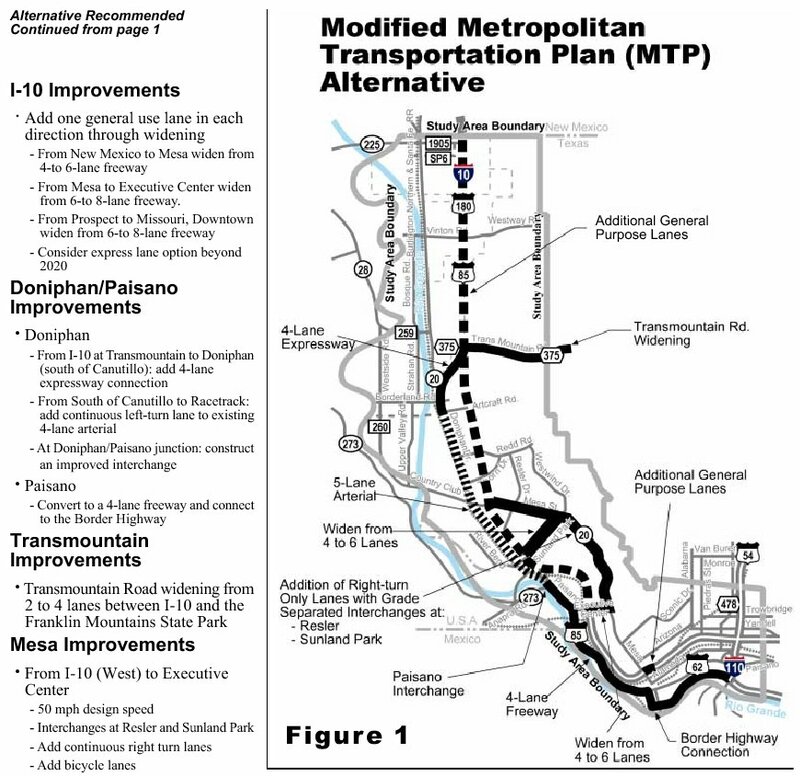 US 85/Paisano is not currently a freeway, but it was recommended to be upgraded to a 4-lane freeway in a 1999 IH-10 west corridor study. Today, Paisano is a rather narrow 4-lane roadway with a few widely spaced traffic lights. 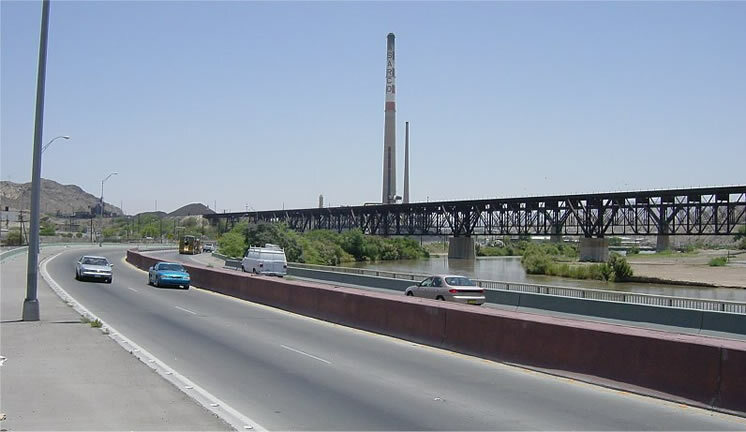 There is very little urbanization alongside the roadway, probably because of the presence of the imposing Asarco copper smelter, which has been inactive since 1999. This section of roadway is heavily patrolled by the US Border Patrol. Apparently it can be dangerous. While I was taking photographs during the afternoon, an agent approached me and asked what I was doing. After telling him I was just a tourist, he recommended that I leave the area before I get robbed. The area was actually deserted at that time, but I didn't stick along any longer than necessary. Most interesting about this section of highway is the views if offers of the shantytowns in Juarez, Mexico. Ever wonder why Mexicans are pouring into the United States by the millions? Seeing the shantytowns helps answer that question. 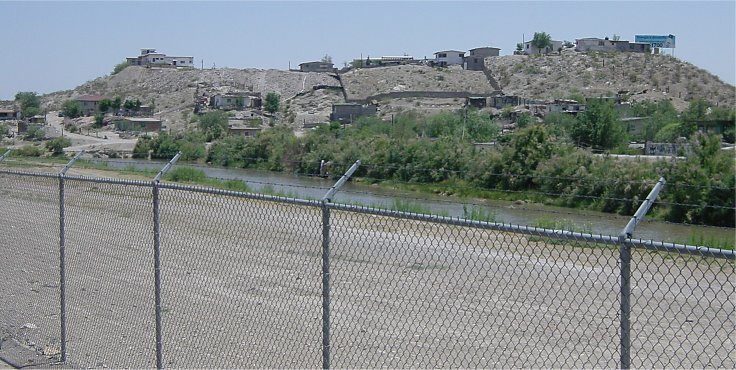 The Rio Grande River runs parallel to the roadway, but it is not very grand at all. Near the Shantytown, it is only about 10-15 meters wide. Near the smelter it is wider. Looking through the TxDOT advanced planning documents, I don't see any projects listed for the upgrade of this section of roadway to a freeway. So it won't happen anytime soon. (high resolution 179k) This view looks southeast towards the Asarco copper smelter, which has been inactive since 1999. The Rio Grande is deceptively wide at this point. A little downstream, it becomes much narrower. The right side of the river bank is United States territory. Mexico begins just a little to the south. Photo taken 31-May-2001. 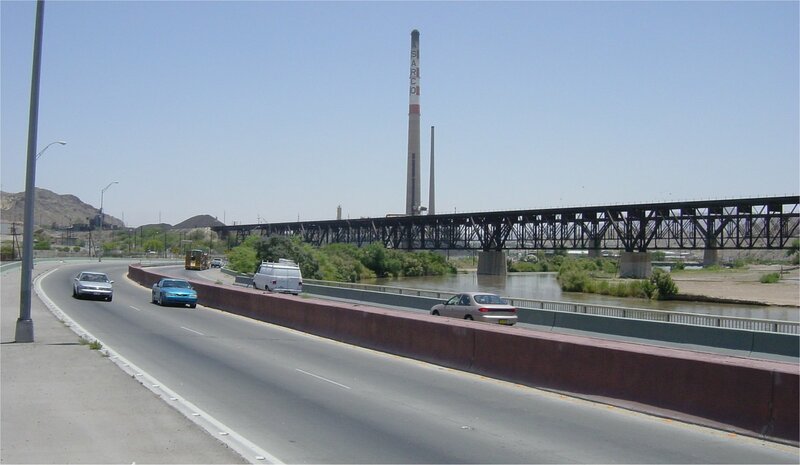 (high resolution 388k) Just south of the smelter, the opposite side of the Rio Grande is Juarez, Mexico. 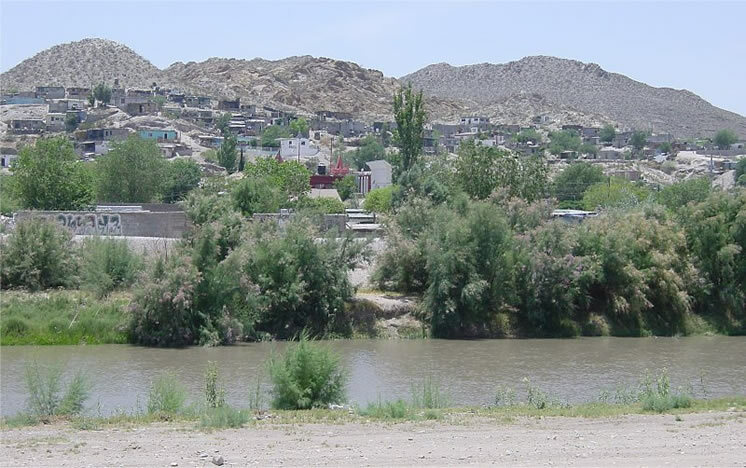 Drivers on Paisano get good views of the shantytowns along the river. The Rio Grande is very narrow here. Photo taken 31-May-2001. (high resolution 320k) Another view of the Rio Grande and Juarez, Mexico. Photo taken 31-May-2001. (high resolution 119k) Driver's view on Paisano, going towards downtown El Paso. Mexico is on the right. Photo taken 31-May-2001. (high resolution 141k) Looking inbound on Paisano. The structures in the background are part of the University of Texas at El Paso (UTEP). An overhead sign for Interstate 10 can also be seen. Photo taken 31-May-2001.